$15 or free with a purchase of $40 or more. 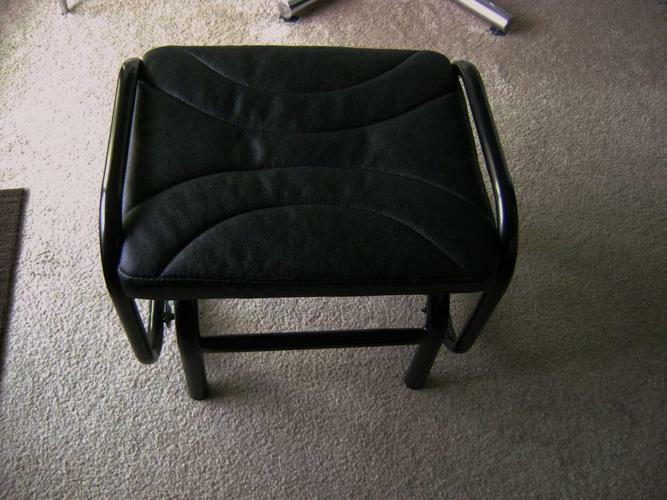 Look at all my listings (39 in total) and find something listed for $40 or buy more than one item that adds up to forty at listed price or over and get this rocking glider footstool for free. Cleaning up the family estate and selling mixed items. Distinguish yourself from others by having great looking items for your Apartment/ condo/home. Always buy uniquer items when you can. The swing can be unbolted to have a stand still footstool or low seat. This gliding top footstool at this low price or free with another purchase, could also be used outside on a covered balcony/patio/sun-room. Use as a back up chair or put it in your kids room. An average person can also sit on it to glide back and forth. $15FIRM or free with purchasing of $40 or more at firm listing prices. These items are still available! Glider $15 or free with $40 or more purchase (chair not for sale). Great for entertaining as backup stool. Anyway you look at it this is a outstanding deal.